Hollywood has Steven Spielberg and China has Zhang Yimou, the senior statesman of moviemaking in the People’s Republic. From Red Sorghum, his 1987 debut right out of the Beijing Film Academy, through Hero, which grossed more in America in 2002 than any film from China before or since ($54 million), Zhang has interpreted the dreams of his countrymen for the world. His latest film, Coming Home, currently in U.S. theaters, addresses China’s collective memory loss around the tough years of the Cultural Revolution; his next film, The Great Wall, due out in November 2016, is an unlikely departure for him and for China—a mega-budget English-language picture co-produced by Le Vision Pictures and China Film Group in China with Legendary and Universal in Hollywood, and starring Matt Damon, a big Chinese monster, and the most Chinese of landmarks. Jonathan Landreth interviewed Zhang by e-mail ahead of his arrival at the fifth annual Asia Society U.S.-China Film Summit in Los Angeles on November 5, a day-long industry conference in Los Angeles, at which the director is an honoree. 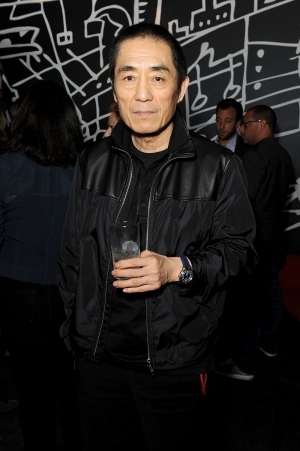 Director Zhang Yimou attends Entertainment Weekly's Toronto Must List Party during the 2014 Toronto International Film Festival at the Thompson Hotel on September 6, 2014 in Toronto, Canada. Jonathan Landreth: You’re being honored in Hollywood but not for an Oscar, not yet. Is Hollywood’s recognition of China sufficient? What does China have to teach Hollywood today? Zhang Yimou: I believe the recognition is quite limited. By contrast, young Chinese audiences’ recognition of Hollywood is very high. The terrific growth rate of China’s movie market has caught the attention of Hollywood. What can this teach them? I really couldn’t say. Because even though our market is growing fast, we are still not satisfied with it. What Hollywood movies do you admire and why? Many. I won’t list them all here. The reason I like a given film is a matter of my own standards—for example, movies that not only are audience-pleasers but that also have heart and meaning, or humanity. What more about the Cultural Revolution might you liked to have included in Coming Home? Why didn't you? Was the film censored? How, exactly? All films in China are censored, including imported Hollywood films. There are no exceptions. The Cultural Revolution is still off limits, for the most part. The things you can say about it are still very limited. Does the big screen have a future in China, or will everybody be watching at home soon? How soon? In China today, more than 10 screens are added every day, and young people treat going to the movies as a topic of conversation, something fashionable. They are not interested in holing up at home. This is very encouraging, and around the world is pretty rare. I hope this can last over the long term. Do you think Steven Spielberg (whose recent film Bridge of Spies deals with a Cold War U.S.-Soviet spy swap) should be welcomed back to China to work on a co-production? Would you like to work with him as you were prevented from doing when he boycotted the Beijing Olympics over China's involvement in Sudan? I have not heard that Director Spielberg was banned in China. His recent films War Horse and Jurassic World were released in China and actually did quite well. I have always hoped to make a movie with him, with each of us directing our own half of the film. It’s just that up until now, we haven’t found a story that pleases the both of us. I hope this day comes soon. What do you think about Xi Jinping’s speech on Arts and Culture in October 2014? How are the directives sent around in the industry since affecting filmmaking and cooperation with non-Chinese filmmakers and film companies? Chairman Xi’s speech on Arts and Culture is very important and I agree with it very much. For example, you cannot “look only towards the money.” To only emphasize the box office is not enough. There need to be more elements and they need to be healthy. What Chinese story do you think would be most likely to appeal to a U.S. audience? A story like The Great Wall, for example. Something that young audiences in both China and the west would want to watch. What I want to do is convey Chinese culture through popular elements and genres. Something like this has never been attempted and is ambitious for both markets. I hope it is successful. What are you personally doing to pressure the government for a film ratings system and a transparent law overseeing the industry? We have all called for a Film Law. We can see progress, and that it’s more and more transparent. The U.S.-China Film Summit is convened by Asia Society, ChinaFile’s publisher, and Jonathan Landreth provided advice to the event’s organizers.